Powerful Automation Training for PLC, Electrical, Mechanical, and Pneumatic Applications! Amatrol’s Tabletop Mechatronics is a portable, durable, affordable learning system that forms a fully automated line to teach real-world mechatronics skills. This learning system features a pick-and-place, gauging, and inventory station, all of which fit on a standard tabletop! Mechatronics is an integral part of the automotive, pharmaceutical and chemical industries, just to name a few. The impact and applications of mechatronics grows by the day, so industries need skilled workers who understand these complex systems. Each mechatronics station include a PLC control unit that features an AB1000 PLC, 10 inputs, 6 outputs, and much more! These stations also include curriculum that covers basic PLC programming and I/O training simulators with pushbuttons, selector switches, and output indicators so that learners can program and operate the PLC before moving actuators on the station. This system’s curriculum features an astounding breadth and depth of automation topics and skills. Key learning areas include: control system concepts, mechatronics safety, programmable controllers, PLC programming language, PLC program analysis, motor control basics, program development, timer instructions, time-driven sequencing, and much more! 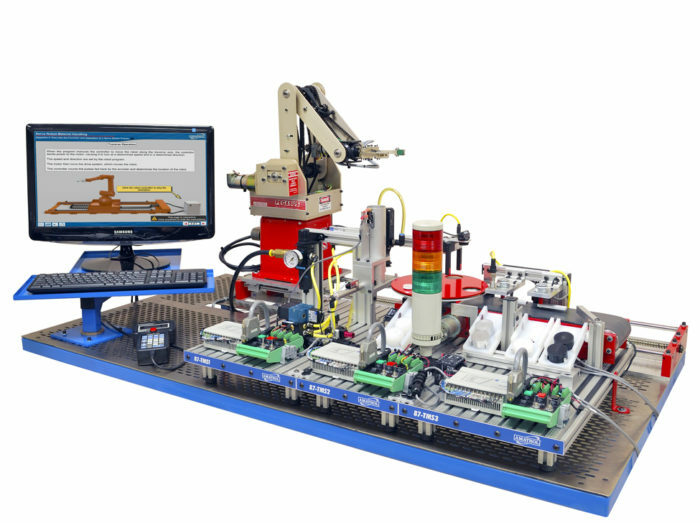 Amatrol’s Tabletop Mechatronics Servo Robot Learning System proves that you can have all the features of a larger mechatronics system with the space-saving footprint of a tabletop system. Wired into the mechatronics system’s’ PLC, the 40-inch long, servo-controlled linear traverse provides the robot with full access to the automated line. As parts are sorted by the mechatronics system and transferred to the appropriate conveyor chute, sensors read their presence and provide inputs to the system’s PLC.